The Greek economy has experienced immense financial market volatility this year. The last nine months have seen the entry of the Greek drachmae into the Exchange Rate Mechanism (ERM) as well as Greece feel the ramifications of financial instability in Asia, Russia and Brazil. Fortunately for Greece, progress made on improving the economy's fundamentals and the likely entry into the European Monetary Union have helped to contain the effects of the financial crisis which is affecting emerging markets around the world. The improvement in Greek fundamentals is evident not only by referring to inflation, budget deficit and wage figures but also other data such as industrial production. In seasonally adjusted terms industrial production in Greece rose by 1.0% in both June and July. Industrial production in Greece is now 9.9% higher than a year ago. The drachmae's entry into the ERM on 13 March 1998 is a pre-cursor to Greece joining the European Currency Unit (ECU). The drachmae was devalued 14% against the ECU and as a result there has been a short-term boost to inflationary pressure. Prior to the drachmae joining the ERM the US Dollar purchased 290 drachmaes, upon joining the drachmae weakened in value with the US dollar purchasing 325 drachmaes. Over the last six months the drachmae has more than made up all the lost ground against the US dollar. By early October the US dollar purchased 285 drachmaes. The Australian dollar has performed poorly against the drachmae for most of this year. 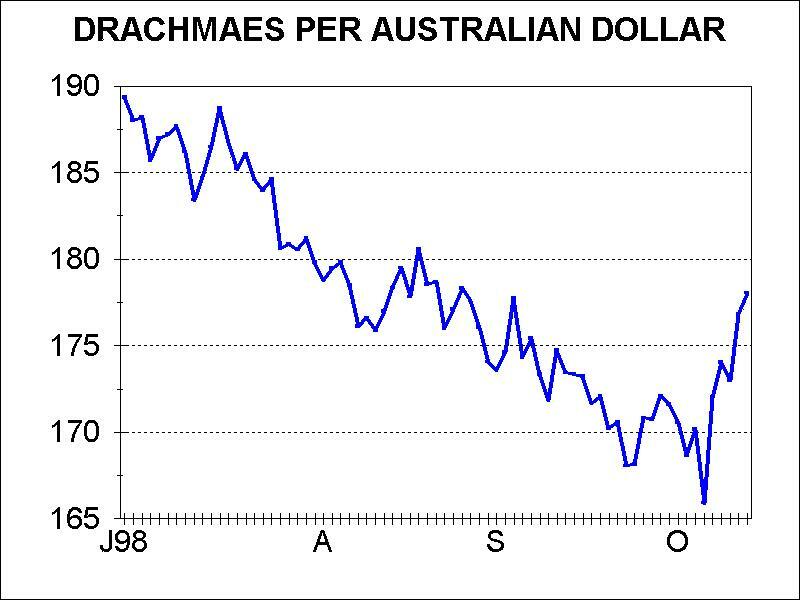 One Australian dollar currently purchases 178 drachmaes compared with around 217 drachmaes in early March 1998. The poor performance of the Australian dollar is attributable to developments in the Asian region and falling commodity prices rather than developments in Greece. Annual consumer prices were 4.3% for February 1998. The inflationary effects of the devaluation saw annual inflation rise to 5.3% by May. The latest figure for inflation shows that inflation for September was 5.2%. The extent of the rise in inflation has been limited by the partial recovery in the drachmae after the initial devaluation, considerable competition and low commodity and energy prices. The inflation shock for Greece is shaping up to be short lived. The indications are that Greek inflation will fall by the end of 1998 to 4.5% and be under 3% by the end of 1999 at the latest. This will in part be driven by government pressure on major retail outlets to reduce the price of certain consumer items and a cut in the price of regulated prices such as those on petrol and other fuels. The government strategy also aims to reduce inflation in a structural manner by reducing the pace of wage growth in the public sector. It is anticipated that this will help stem the rise in prices in government services which have been a large source of growth in prices. This policy measure is significant since wage rises in the private sector are expected to follow suit. Wage rises in the public sector are used as a benchmark for wage increases in the private sector. For the economy as a whole, wage growth is expected to decelerate further from 6% in 1998 to 4% in 1999. Achieving an inflation outcome under 3% is the first major convergence target which Greece needs to achieve in order to meet Maastricht criteria for Economic Monetary Union (EMU). The benefits Greece will secure from entry to ERM alone are immense. From the perspective of international investors the extent of foreign currency risk associated with investing in Greece has diminished dramatically. A currency, which joins the ERM, must not vary by more than a given percentage of an agreed value. As a result the risk of a free fall in the value of the drachmae and hence the investment is reduced. As a result the overseas investor is less likely to make an excessive capital loss in non-drachmae terms on his investment as a result of a fall in the drachmae. In Greece’s case, the determination with which speculative attacks on the drachmae have been defended by the Bank of Greece are a disincentive to further attacks and a sign to international investors of the determination of the Government to join the EMU. The determination of the Government to join the EMU has been translated into credibility for the Government. This credibility has prevented an outflow of capital, a falling currency and excessive inflationary pressures which have characterised emerging nations such as those in Asia. Despite the recent fall in the price of Greek financial assets which has followed the meltdown in Russia, Greek assets have still performed well in US dollar terms. The Athens Stock Exchange (ASE) from the beginning of 1998 to early October 1998 has been the fourth best performing Stock Exchange in the world in US dollar terms having risen by 19.5%. The ASE Index is currently around the levels recorded about a month prior to the drachmae entering the ERM. The privatisation of other government assets in the near term are likely to be met with keen interest, despite the sell off the Athens Stock Exchange has experienced in recent months. 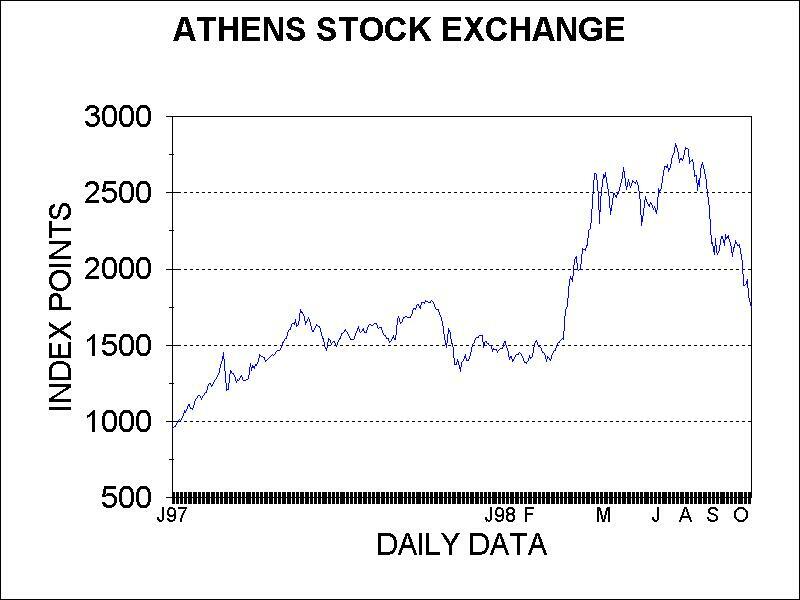 The fall in the Athens Stock Exchange has been a disappointment. The fall should be seen in the context of considerable falls in the equity markets of most nations around the world. The credibility of the Greek government and progress towards meeting EMU objectives has prevented a much larger fall in the equity market. Greece continues to make impressive progress on reducing the government’s budget deficit. Prime Minister Simitis has foreshadowed further government expenditure restraint for the foreseeable future. For 1998, considerable progress on reducing tax evasion has contributed to an expected budget deficit of around 3% of Gross Domestic Product (GDP). For 1999 the budget deficit is likely to be around 2 1/2% of GDP. Once Greece’s budget deficit falls under 3% of GDP then another key criteria which Greece needs to meet in order to join the EMU will be met. Greece’s public finances have improved immensely from 1990 when the budget deficit was equal to 16.1% of GDP. These budgetary outcomes are a far cry from the big spending, large budget deficits of the Papandreou government. There are several reasons for the improvement. Growth in government expenditure is being contained while the determination to reduce the extent of tax evasion and widen the tax base is producing results. In addition, a variety of government assets are being sold and part of the proceeds are being used to reduce debt. In turn, the government’s interest bill is reduced and this further helps in the reduction of the budget deficit. Government Business Enterprises (GBE’s) once sold typically cease making losses. Once profits are generated this results in taxes being paid which contributes to reducing the budget deficit. The problems posed by loss making GBEs were compounded by the manner in which the Greek government funded the losses. Losses incurred by GBE’s were funded through government bond issues under the "tap system" of issuing government bonds. Under the "tap system" the government set the interest rate it paid on the bonds it issued. Typically the rate was set too low. The shortfall in bond sales, which resulted, was met by the Central Bank. The Central Bank bought the surplus bonds and issued money. This is called monetising the deficit or printing money to meet the deficit. The end result was inflationary. Fortunately for Greek inflation, GBE’s are being sold and the "tap system" of issuing bonds has been abandoned. Recently, the government completed the sale of its remaining shareholding of Hellenic Duty Free stores and sold a first tranche of 20% in Hellenic Petroleum. The government is committed to further privatisations. Future sales include Olympic Catering, a third tranche of Hellenic Communications, Athens Water Supply, Corinth Canal, Hellenic Electricity and several other entities. The road to economic convergence and the EMU for the Greek economy is not free of risks. Public debt remains a constraint on the economy. Public debt to GDP is expected to rise from 107.8% in 1997 to 108.7% in 1999. The costs of meeting interest payments are a constraint on the budget. Any increase in interest costs will lead to a larger budget deficit outcome and this will erode the government’s ability to join the EMU. Long term interest rates, such as ten year government bonds denominated in drachmaes rose to 8.75% in early October compared with 7.8% at the beginning of July 1998. The increase has been the result of developments in Russia. In the event that emerging markets such as Russia, South Korea and other Asian economies have a greater amount of risk attached to them then there is a reasonable chance that this will be felt in Greece through higher interest rates. The Greek union movement is living up to its reputation of tenaciously obstructing Government efforts to sell GBE’s, reduce wages and the make the labour market more flexible.. The union movement has little scope of altering economic policy direction given that the Socialist Government and the conservative New Democracy opposition have similar policies on the privatisation of government business enterprises and the need to enter the European Monetary Union. The Simitis government cannot compromise or dilute its stand on the privatisation of government enterprises or not introduce labour market reform. To do so would result in a loss of confidence in the determination of the government to meet Maastricht criteria. The resulting loss of investment to Greece could see higher interest rates and a fall in the Stock Exchange. Although the sale of GBEs will not be on time, privatisation objectives are most likely to be achieved. Once the uncertainty attached to global financial markets eases and on the basis that Greek economic fundamentals continue to improve there exist considerable opportunities for investing in Greek financial assets. Over the course of the coming two to three years Greece is expected to be re-rated upwards as a result of joining the EMU. This is expected to draw more foreign investors into the Greek market with current prices for shares and bonds rebounding from the levels the Athenian Stock Exchange has fallen to. The author has investments in the Athens Stock Exchange and has recently travelled to Greece on an independent and unescorted basis.